If you are playing in a club or explored some more advanced features in your chess program, you will surely came across the rating of a player or chess engine, expressed as a number: The Elo Rating. The system of deriving a number according to a player's strength is named after its Hungarian inventor Arpad Elo. While the system is by no means perfect and alternative models have been proposed, it is nonetheless widely used in games like Chess and Go or any other 2-player game where the game's outcome is either a Win or a Loss but also allows for a draw as it often happens in chess. (To be precise, the Elo system considers a draw to be half a win and half a loss). After a (rated) game is played, the rating of the players is adjusted dependent on the game's result and the original rating of the players. In simple terms, the system is exchanging points between the players with the winner gaining points by the loser. In theory, you can even apply the Elo system to any game or sport were two players or teams face each other like football or hockey. Obviously, the system is losing its strength in such sports as it would not differentiate between a 9-0 win or a 1-0 win. The former case would imply that the winning team is performing much better than the losing one, whereas in the second case the playing strength of the winner is only marginally better. It is important to note that the Elo rating system is a relative one: It measures the relative strength between players only within the same pool of players. For example, a player with a FIDE rating of 2000 may be stronger or weaker than a player with a rating of 2100, who plays in a different chess organization. Furthermore, the system is implemented differently among various organizations and it is therefore advised to refer to the organization's rating rather than to the Elo rating. For example "Player X has a FIDE rating of 2500 and an ICC rating of 2600". One good example where such differences become obvious is the comparison between FIDE ratings and computer chess engine rankings. The best computer engines are rated at well over 3,000 ELO points which would imply they are far superior than even the world chess champion. While the best chess programs can be considered to be unbeatable nowadays, at least as long as they run on a reasonably powerful computer, the difference in playing strength between the computer and human world chess champions is not that pronounced. An other weakness of the Elo grading system is inflation. Over time, the average rating of a player is slowly increasing, making comparisons like best chess player in history difficult to undertake. We will never be able to accurately say whether Bobby Fischer or Garry Kasparov was the better player, even though Kasparov's peak performance rated him higher. Although with some clever maths and computer models a more direct comparison can be made, it is debatable how accurate they are. Also, playing styles in chess vary and a player from a hundred years ago would have differing opinions of what good play constitutes than a modern one. As for the calculation, it is a rather easy one but not something that you would be able to perform in your head, unless you are a genius or are lucky enough that the numbers turn out to allow for an easy arithmetic. 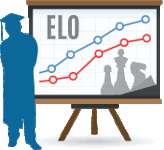 Therefore, Lion Chess provides you with an easy to use Elo rating calculator to allow you to calculate your new rating number after a graded match. Please note that the calculator is based on the FIDE system, which is also subject to change and it should not be used for official rating calculations.